Lama Zopa Rinpoche offered lunch to Dagri Rinpoche and his attendant, Ven. Tenzin Gyaltsen, Root Institute, Bodhgaya, India, January 2019. Photo by Ven. Roger Kunsang. 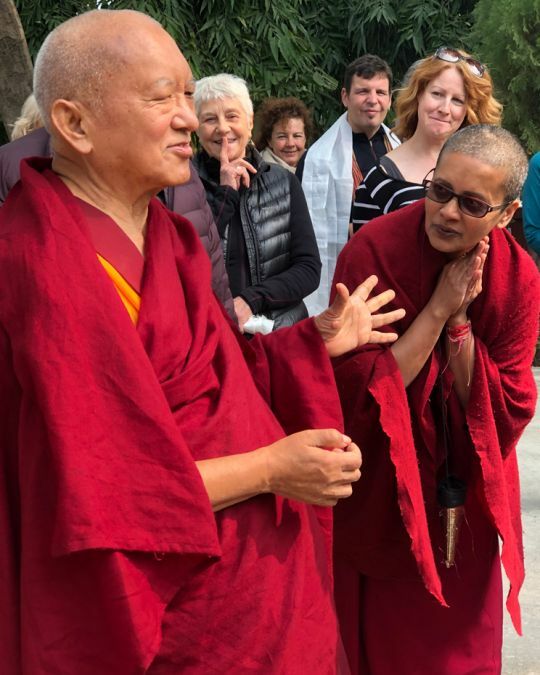 Lama Zopa Rinpoche will now be teaching at Ganden Center, Latvia, on June 27 – 29 2019. 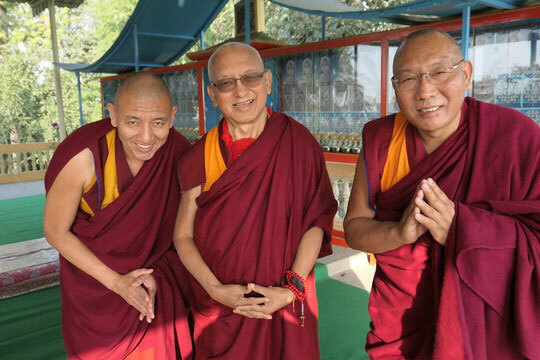 Recordings of Rinpoche’s recent teachings are always available to you at Rinpoche Available Now. Lama Zopa Rinpoche recorded a personal thank you for those who made it possible to offer food to all the monks at Sera Je Monastery for the last twenty-seven years, and enabled FPMT to offer a significant endowment fund to the monastery whereby the interest covers the annual costs of providing three nutritious meals daily to all the monks. Rinpoche’s message covers many aspects of why offering food to Sangha is so beneficial and meritorious. We bring you an edited transcript of this precious teaching. 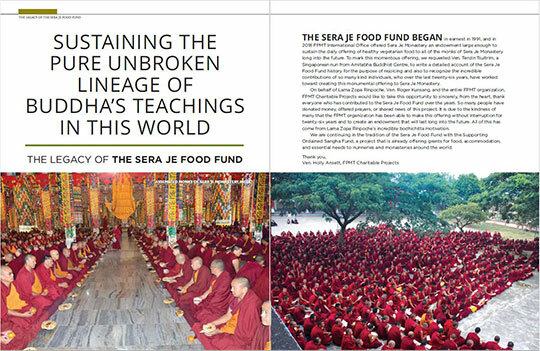 We also bring you an extensive article, “Sustaining the Pure Unbroken Lineage of Buddha’s Teachings in This World: The Legacy of the Sera Je Food Fund,” which is an in-depth look at the accomplishments and historical context of the Sera Je Fund since its inception. You can view this article in eZine or PDF format. Please join us in rejoicing in this incredible offering! Our heartfelt thanks to all who have supported this project over the years, we could not have done this without your kindness. 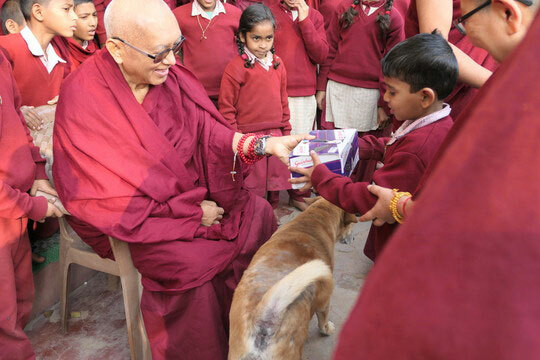 Lama Zopa Rinpoche gave a talk at Root Institute’s Maitreya School and offered new shoes and socks to the school children, January 2019. Photo by Ven. Roger Kunsang. It has been busy in Bodhgaya, India. As you can read above, Lama Zopa Rinpoche attended the teachings of His Holiness the Dalai Lama in late December there, and also spent time at Root Institute. We bring you Cynthia Karena’s experience of attending His Holiness the Dalai Lama’s teachings. Mandala magazine and all the communications work of FPMT International Office–including this e-News and the daily FPMT News email—is supported by the Friends of FPMT program. If you’d like to receive the next issue of Mandala and help benefit FPMT students around the globe, see below! Please join us as one of our Friends during our Days of Miracles drive, which extends through March 1. Becoming a contributing Friend of FPMT means supporting all of the activities of FPMT International Office – helping us expand access to Dharma programs and materials, making live online teachings of Lama Zopa Rinpoche available for free year-round, and funding our services to local FPMT communities around the globe. 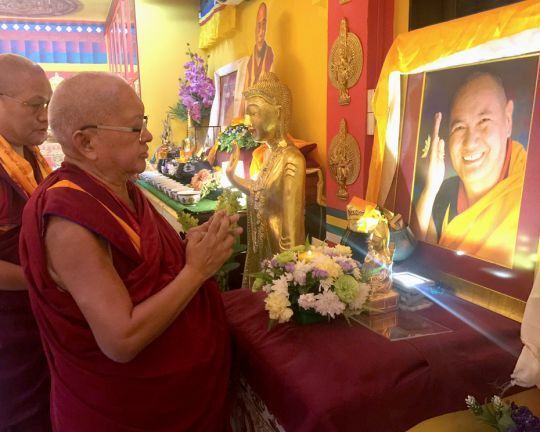 Friends of FPMT play an indispensable role in making our international mandala flourish! Plus, Friends members enjoy free access to what they are helping bring to others, with new benefits being offered this year. Please help us reach our goal of welcoming 108 new Foundation Friends, 108 Dharma Supporters and 21 Patrons! Read more about the giving levels and member benefits. This compilation of essential information to note, provided in previous communications during 2018, is available now in the Compilations of Key Advice page in the Resources at a Glance section of the Affiliates Area. World Leprosy Day was on January 27 this year. 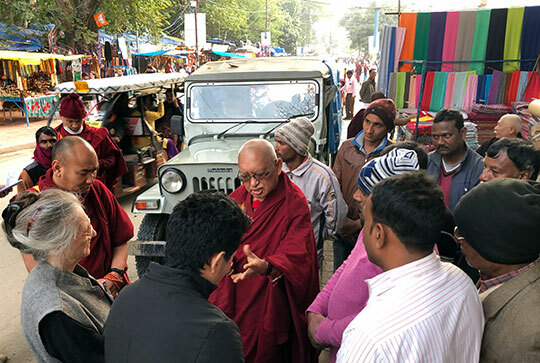 For many years, MAITRI Charitable Trust, an FPMT project based in Bodhgaya, Bihar, India, has been assisting those affected by this disease, via treatment and education about this disease. Would you like to spend your days in a very meaningful way? Have a look at the regularly updated meritorious opportunities to offer service as a volunteer or as paid staff in FPMT centers, projects, and services around the world. Newly added: Atisha Center, Australia, is looking for a director; Vajrapani Institute, USA, needs a center manager; Land of Joy, UK, is looking for a general manager and a housekeeper.